Content Curation simply defined is when you organize highly relevant content from the Internet along with your own content. Last year, for the first time, content curation and aggregation (38%) outpaced content creation (34%) as the “top investment area” for online marketers. The rise of all things curated has had a dramatic effect on the way people access and consume content from the news to music to movies … even to apps and products. Most understanding of curation is sharing other peoples content through your social channels. Eventhough the links appear in your feed, the links lead directly to the articles page. Our Kbucket solution is different. We give you the tools to curate content on your own branded page. Ideally you want the collection to be topic based and concentrated. The idea is to create reference libraries around topics that interest your target market. 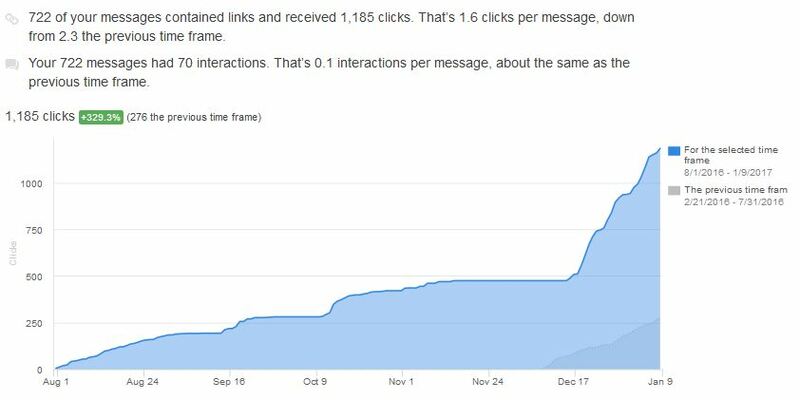 In this post we discuss the results of a 6 month study demonstrating the power of KBucket curation to drive inbound traffic. The results posted are from links shared from our “KBucket Page” and measured by our HubSpot service. To put our results in perspective I am comparing the cost of driving inbound traffic from a Facebook ad campaign, a twitter growth hacking solutions called “Market Hub”, and links shared from our KBucket page. At first glance the results are truly unbelievable. We shared 772 messages and received 1185 clicks. That is a 153% CTR which is phenomenal by any standard. The inbound traffic generated is consistent and predicated on both the number of articles shared and the number of followers on your social channels. We currently have about 5000 followers on Twitter, over 500 connections on LinkedIn and Facebook post reach has been a mere 555 in the last month. Obviously larger channels will produce better results. Let’s now compare the KBucket results with a Facebook ad campaign and the results generated by “Market Hub”. On Facebook we marketed a landing page to promote our browser extension and a blog post to promote our curation solution to journalist. My intent here is not to say that curation will replace advertising, since advertising has a much wider reach than curation. My intent is to show that curation is a lo-cost way to drive consistent traffic from your social channels. MarketHub is a twitter lead generation platform. This solution is a more direct competitor to our KBucket solution. However “MarketHub” doesn’t directly drive traffic to your site, they simply ad a “Click to Action” banner at the bottom of every link they share and the banners drive traffic. The industry average performance for successful banner ads is between 1-2%. Below I have entered my Google analytics results for inbound links from Twitter. I am attributing 60% of those links to “MarketHub”, since I don’t have access to my dashboard anymore after I cancelled my account. Note: Our cost is based on results generated in the last 30 days. 508 Messages Shared, generated 908 clicks. In practice, we know that not all clicks result in visits to your site, which is the metric we seek. A good portion of clicks generally don’t convert because they were either generated by a bot, or the user decided to abort the visit because the page wouldn’t load fast enough, or for some other reason. So in practice your real Cost Per Click (CPC) is higher than what the vendor reports. We are obviously interested in measuring the real Cost Per Click (CPC). So let’s take a look at the visits generated to our website from our curation efforts. Notice that our efforts were spread across Twitter, Facebook, LinkedIn and Google+. I am using Google Analytic to report this data as the HubSpot data only measures visits to my blog page. Most of the links shared are to the KBucket page that is not included in my Hubspot analytics. Our total traffic is a combination of traffic driven to our KBucket page (604 + 179) and the traffic to our blog post (239) for a total of 1022 links. This is less than the total number of clicks reported by Hubspot (1185) but still a 141% CTR. Following chart shows the traffic we received by sharing our original content. Why does KBucket perform so well! To examine the answer let’s review the process first. We subscribe to various influencer news letters, We also use services like BuzzSumo, Drumup, Nuzzel, Degreed to deliver the most popular articles on topics of our interest. You can see our own list on discovery tools for reference. Additionally, we read trade magazines and curate links that provide solutions to our business problems. Other useful sources are services like Reddit or StumbledUpon where you can track peoples interest and trending articles. This implies that the curated content in our channels are already ranked high in popularity and in search engines. No wonder they perform so well! Influencers research their headlines and write articles people want to read; that’s why they are influencers. Their content naturally performs better. As a curator you should pay close attention to your selected articles. Make sure your curated library covers a broad range and you are not repeating the same angle from multiple authors. Just pick the one that resonate best with you. Your followers should know you are taking time to get them the best information possible. Your work never gets old – Curating ever-green links! We have been curating for over 6 years now, and have found that many great insights and articles are as useful today as they were when they were first published. In some cases where the world has moved on and the advice or report is out of date, you can still provide value by pointing out how the things have changed. For example we have been creating lists of products and some date back to 5 or 6 years ago, and naturally a number of them are no longer around. That in itself is an interesting piece of information, don’t you agree? A list of companies that went out of business, allows you to investigate and analyze the direction and challenges of your market! If you curate 3 links a day, 15 days a month, you will have over 780 links in your curated library in just one year. Little drops of water make a mighty ocean. Stay disciplined, record your insights as they occur and soon you will have an incredible resource that will drive your inbound traffic and establish you as a thought leader in your field! KBucket makes this all easy! KBucket makes it easy to host hundreds of links on one page and make them all accessible. Each page is divided into multiple groups and each group offers one or more channels. Each channel lists a number of links, that can be quickly navigated with category, publisher and author tags. Hundreds of curated links, translate into hundreds of unique shares from your researched library of curated content. Furthermore, when users land on your KBucket page, they find a wealth of information on related topics that increase engagement with your website. Scheduling links should be automated. If your scheduler let’s you upload RSS feeds, you can simply queue your entire library to run in intervals, delivering great content. Some schedulers like HubSpot, force you to enter every link manually, but still give you the opportunity to schedule the same link over a period of time, which is still more efficient than doing it manually. In social media people follow others because of what they share! When you share useful content, you will attract better targeted followers in social media. Each shared link adds the author’s Twitter handle to your message. This will let the author know you are sharing their content. As a result, you will now have an opportunity to connect with those influencers, as you have now separated yourself from the crowd. Some of our own tweets are directly to the author of the article, letting them know how well their links are performing in our channel. To build influence and get noticed, reciprocity is a powerful driver. KBucket is a excellent way to get backlinks to your site. We welcome both site owners and digital agencies who help their clients with their social media strategy. Signup for a demo, download KBrowser(Firefox), Kurator (Chrome) and amplify your social media strategy.